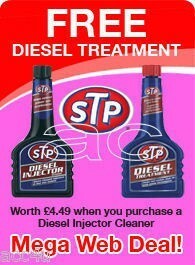 A high strength, super concentrated cleaner specially formulated to remove deposits from diesel injection systems. Clears clogged injectors in just one tankful, quickly dissolving deposits to improve performance. For best results use every 3,000 miles. Safe for catalytic converters. Clean and condition fuel delivery system. Specially formulated to remove varnish, carbon deposits and water from diesel fuel systems to prevent poor performance, corrosion and fuel wastage. Contains a cetane improver to enhance cold start performance. For best results, use every 1,250 miles. Safe for catalytic converters. Restore lost power and performance.